I love participating in game jams, where game developers get together to craft games in a very short amount of time. 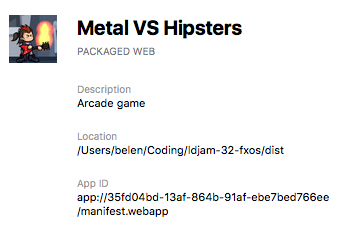 I thought it would be cool to take one of my past Game Jam games, Metal vs Hipsters, and port it to the mobile web and Firefox OS. 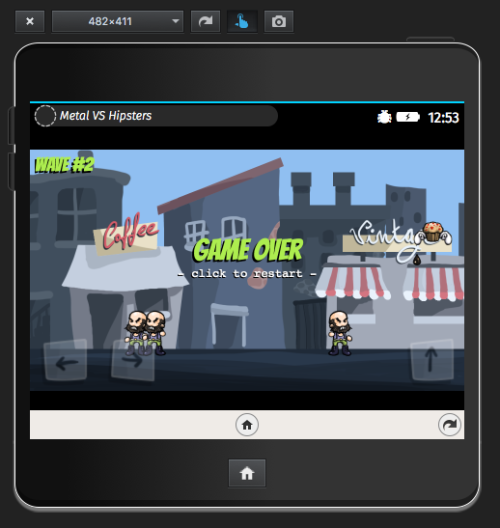 My starting point was an HTML5 game built for desktop. It had a fixed resolution, was controlled by the keyboard, etc. Some minor (and major!) tweaks would be required to make it a mobile game. The game uses the open source game engine Phaser, so some of the code shown here will make use of Phaser’s API. You can check out and play the final mobile version here. The first tool I used was Firefox’s Responsive Design View. It allows you to crop the screen and simulate different screen sizes. You can access it from the Firefox browser Tools drop-down menu under Tools>Web Developer>Responsive Design View. The other tool was an actual mobile phone! I have an Android device with several browsers installed. By running the game in localhost and then connecting my phone to my local Wi-Fi network, I could access the game at my computer’s IP. Furthermore, in the original game I used a wrapping div element to center the game on the page and also add some padding, text, etc. Now, all these page elements would have to be removed for the game to access all the available screen space. 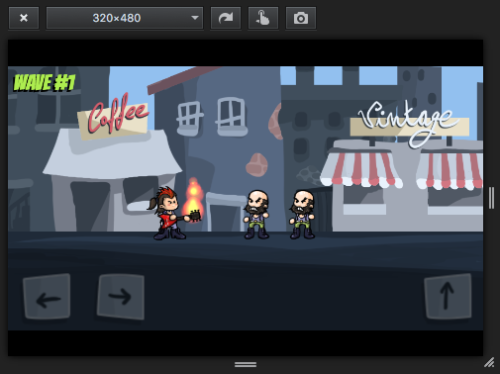 Since Phaser.Button doesn’t have a flag that tells us whether a button is pressed or not, I needed to add it myself. This is easily done by listening to inputDown and inputUp events. For moving, it was just a matter of checking the isDown flag I’d already set, in addition to the previous check against the this.keys.left keyboard key. While I was playing the game I noticed that my own fingers would hide the game characters. This was a huge deal, since it made the game very difficult and annoying to play. 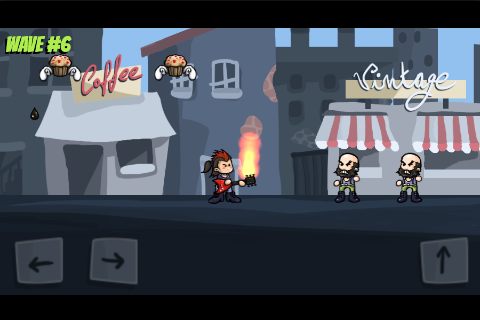 The solution was to make the group bigger (100 pixels) and then shift all the game elements up. I also found out that tapping on the click to restart text was a bit hard. 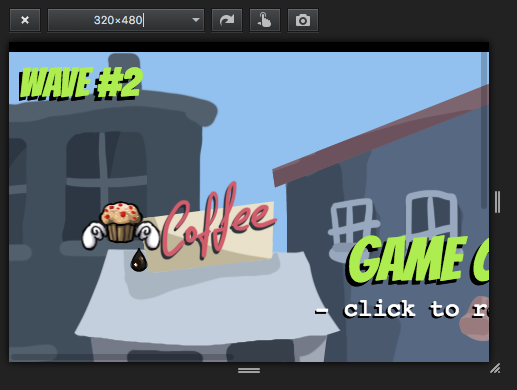 So I made the Game Over text, which was bigger, clickable too. In addition to that, I substituted click to restart for tap to restart, which makes more sense in mobile environments. The splash screen needed some love too, since it was originally hardcoded to a fixed resolution. Then I resized some of the existing text and buttons, and deleted the controls help diagram, since it referred to desktop arrow keys. Finally, the game was fully playable… but now it was too short! 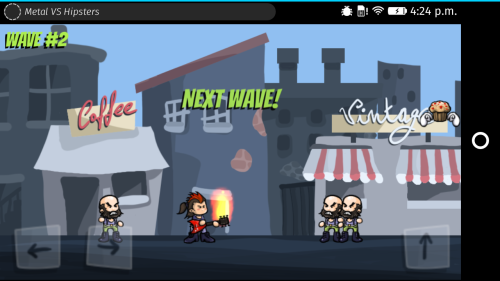 The original game had five predefined waves of enemies. It was fine for the game jam, since most people only try the games for a very short amount of time (there are literally thousands of games to try out). For a mobile game, one quick minute of gameplay is not good enough. So I tweaked the gameplay code to get rid of the predefined waves and make them random and infinite. Unlimited playtime! Once the game worked decently and was fun to play, it was time to turn it into a Firefox OS app. The first step was to run it as a hosted app in a Firefox OS Simulator. You can get the Simulator from the WebIDE (Tools > Web Developer > WebIDE) by clicking Install Simulator in the right sidebar. I installed Firefox OS version 2.6. To create a hosted web app, we need an icon referenced in a JSON file with some metadata. 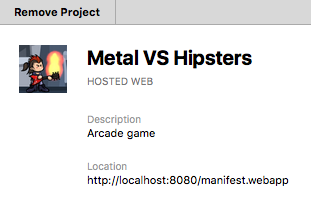 This file is called the web app manifest. 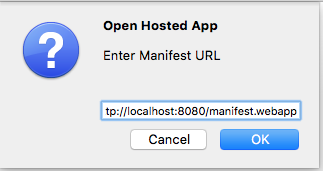 The manifest file is just a JSON file in our app’s root. It contains some metadata about our app: the name of the app, the author, locales, etc. This is what the initial version of my manifest.webapp looked like. …and we can finally run it in the simulator. Running a game in the simulator is cool, but nothing beats playing your game on a real device. I wanted to create a packaged app in addition to a hosted app for Firefox Marketplace. I had an Xperia Z3 Compact with Firefox OS on it ready for action. Once plugged in via USB and with developer mode enabled, it was listed in the WebIDE on the USB devices list. With my phone selected as a device, I clicked on the “play” button in the top bar and… boom! Now that I had the game running on a phone I could take advantage of some settings available only for apps and not just mobile websites. I wanted the game to run in fullscreen (without any prompting!) and I wanted to force a landscape orientation. I was able to do this by adding some more settings to the manifest. 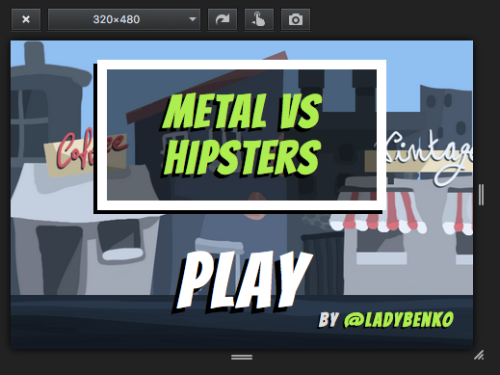 Now that I’d built the game as a packaged app, I needed to include all the assets needed to run it. The game uses one font from Google Fonts, Bangers. For the game jam, I included the font using one of Google’s suggested methods: linking to CSS on their servers that contains the font definition. As you can see, this won’t work for a packaged app, since it’s possible for a player to launch the game for the first time while offline, and they would not be able to access the font. Luckily, these fonts are also available for download and distribution with your projects (yay for open source! ), so I did just that. I copied the content of Google’s CSS file to my own CSS, changed the src URL to point to my local copy, and everything was set! A packaged app is distributed via a single zip file with our application on it. I was using a task runner, Gulp, to automate some parts of the development; so I added a new task to generate this zip file automatically. I made use of the gulp-zip module. Tip: once generated, always unzip your file to make sure everything is there! You can submit your app to the Marketplace, but you will need to create an account first. Once logged in, I selected Free App, then Packaged and uploaded the zip file. Then the manifest and app files were validated. There were some warnings related to the CSP, but since the game doesn’t ask for special permissions (like access to the contacts), it’ll be OK. These CSP warnings were due to Phaser using document.createElement('script') when using bitmap fonts. Since my game wasn’t using these fonts, I could just monkey patch Phaser and remove that code bit if I really needed special permissions for my game. This application does not store or collect personal information or any kind of user data. As the last step, I was asked to setup content rating. The submission form takes you to the IARC tool, which is a wizard to help you rate your game depending on some criteria. 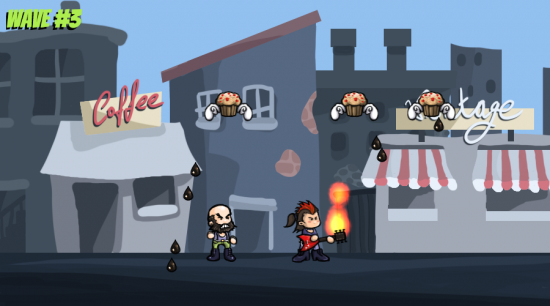 Since my game features a form of fantasy violence –I guess a guitar of flames that destroys hipsters and cupcakes counts as so–, this ended up rated as PEGI-12. All done! Now time to wait a bit until it gets reviewed and approved. Not all browsers have the same support of features or file formats. While testing the game in different devices, I found out some issues with Safari on iOS: the webfont wasn’t loaded properly and the background music tracks was not being played. The issue was that Safari for iOS doesn’t support neither Woff nor OGG as formats for fonts and audio (tip: you can check these things in Can I use?). 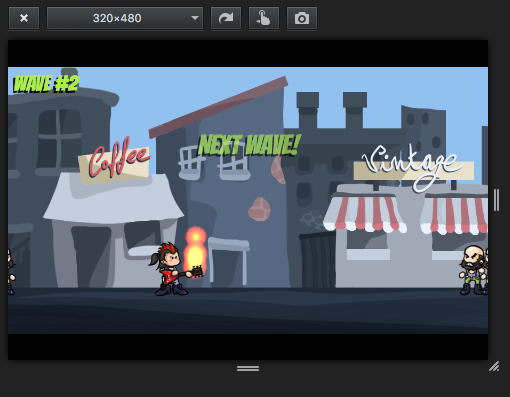 All I had to add to be able to play the game in my iPad was to add those assets in TTF and MP4 as well. The game should be playable in major major mobile browsers (Firefox, Chrome and Safari). I expect trouble with IE/Edge, but I don’t have a Windows device at hand to test this. 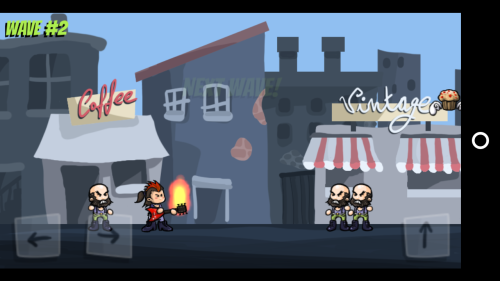 Although the current version is fun to play in browsers, there are other improvements that could make this a better game: use of the vibration API when the main character gets killed, store the high-score with localStorage, allow installation of the app directly from the game’s website, support for offline mode in the web version, etc. The game is already available in the Firefox Marketplace for downloading. 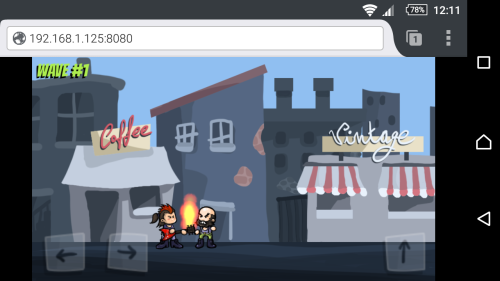 You can also play the game from your mobile browser here, and grab the full source code at Github as well.